Since this is my first post let me give a little background on where I started and how I came to be where I am with this conversion. About a year ago I started following a weekly video on electric cars with Jack Rickard and Brian Noto of EVTV (EVTV.me). I discovered the videos as I perused YouTube videos on electric cars. Once I stumbled across the first videos they did out of Jacks garage I spent the next several hours watching several more of the videos that they had created over the previous months. After this initial introduction into the world of conversions I was hooked. I started watching Jacks videos every week and reading the blog. With each week I learned more and more about the conversion community and the more I wanted to be a part of that community through a conversion of my own. The final push to start me on the path to my first conversion of when I attended EVCCON 2011. The first ever convention of it's kind held in Cape Girardeau, MO. It was through this convention that I met others like me who are passionate about alternative technology and electric transportation. The first EV I took a ride in was a converted VW pickup. It was exhilarating and felt like nothing I have ever experienced. I knew at that point I had to have an EV of my own. With that, welcome to my conversion blog. I will be sharing my progress as my build unfolds from start to finish. 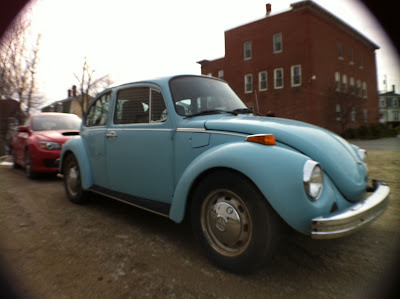 For my first conversion I selected a 1974 Volkswagen Super Beetle. There were several considerations that went into the vehicle selection of my first conversion. I wanted a platform that was easy to work on with parts that are readily available. I also wanted something that wasn't going to require a lot of electronic spoofing to get the gages to work. Essentially I needed a car that was about 30 years old and was mass produced with a cult following that maintains a healthy parts selection...so a Beetle. The day has come to pull the engine! Sunday (June 17, 2012) was my first day really working on the car. Before this point I had just been cleaning out the interior but nothing too noteworthy. Sunday the gas tank and engine came out of the car. It's truly remarkable how simple these items were to remove from the car. Just 4 bolts and few hose connections on the gas tank that came out with a few tugs. The Engine was a bit more tricky though there were not many connections holding that to the car either. To make things easier to get to the hood and truck lid were removed right from the start. For my conversion I opted to retain the clutch and fly wheel assembly. To reduce the weight on the flywheel I am having the ring gear and some of the material around it machined off. The sliding the engine out from under the car was a little tricky as there isn't much room there to work with once you pull the engine back off the transmission. The rubber gasket around the inside engine of the engine compartment needed to be removed to make use of every last millimeter. That's enough for day 1!